This Demonstration shows the equilibration between two objects at different temperatures in thermal contact with one another. In this case, the objects are a human and a chair of equal mass. where represents heat capacity and ρ represents density, the subscripts 1 and 2 stand for the human and the chair, is the thickness of the skin barrier and is the thermal conductivity of the skin barrier. 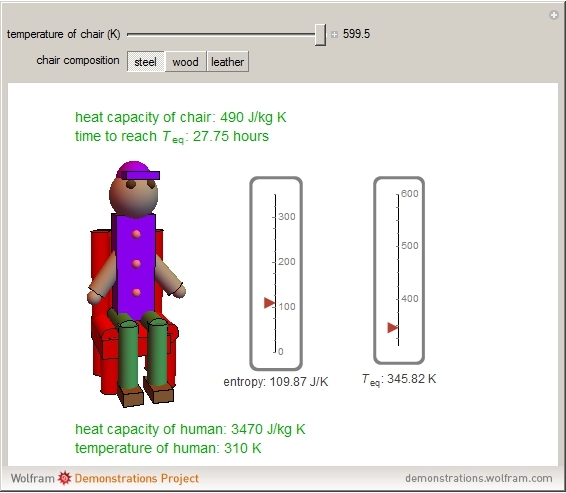 "Heat Flow between a Human and a Chair"